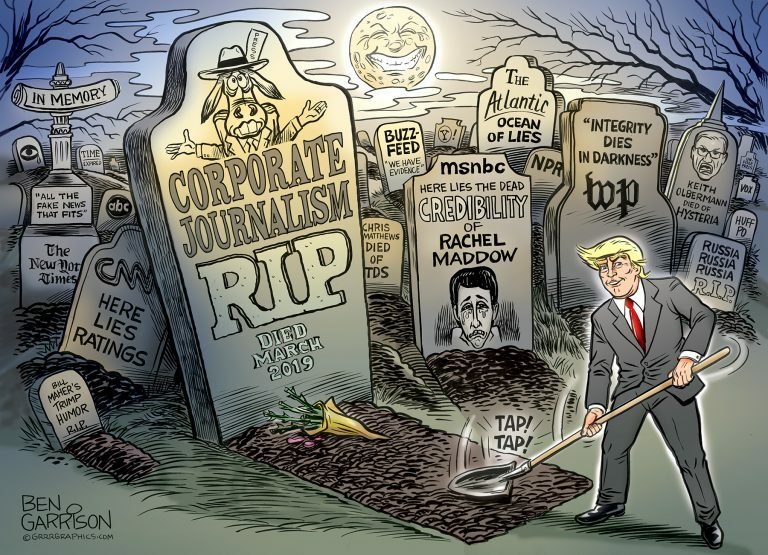 For the past two years, it’s been Trump and Russian collusion all the time, every day, and everywhere we see media bias. Some outlets were more egregious than others in subjecting their audiences to relentless chatter about what they believed to be true, rather than merely reporting the news. Among the many “journalists” who espoused the Democratic Party position on the Mueller investigation, some especially boisterous voices stood out from the crowd. So, in a rather non-scientific study, Liberty Nation republishes a few comments that were quite simply over the top. A hostile media environment has yielded much unnecessary angst and vitriol. While some are willing to backtrack their comments a bit, others are holding fast to their original remarks. According to Brent Baker, Vice President for Research and Publications at the Media Research Center, CNN has used the mantra “does not exonerate” 120 times a day since the Mueller probe ended. And MRC’s Rich Noyes wrote that for “roughly three minutes a night, every night, for an astonishing 791 days,” the media has been poking this mystical Russian bear which has turned into – in the president’s words – a Collusion Delusion. So, without further ado, here are Liberty Nation’s top 10 outrageous media statements about President Trump, his alleged connections with Russia, and a 2016 election conspiracy. This is by no means the be-all and end-all of verbal high crimes and misdemeanors by media elites, but a few of these remarks are real head-shakers. The following is a compilation of Todd using the word “crime” in connection with Trump four times in just one episode of Meet the Press. “Is there more to the Manafort-Russia ties than we know? Could Carter Page’s own Russia ties have been pursued in a way we simply haven’t heard about? What about George Papadopoulos’s talks with a Russia-allied professor who said Russia had ‘dirt’ on Clinton? Maybe it has something to do with Trump Jr.’s meeting with a Kremlin-backed banker at a National Rifle Association convention? Or the elder Trump’s broader efforts to do business in Russia, through his then-attorney Michael Cohen — possibly including a supposed proposal to give Vladimir Putin a $50 million penthouse in a proposed Trump Tower Moscow? National Emergency Coming! Bully for The Donald!